It has been a while. Hope you're doing well. We should talk more, really. So things have been going well all in all. Training is good. Life is good. Yah dee yah. 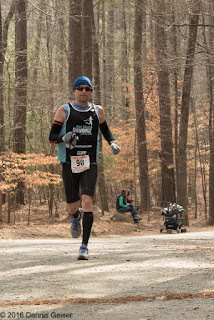 The Umstead Trail marathon is on the first weekend in March every year, now in it's 13th year. Last year was cancelled due to atrocious snowy, wet weather the week preceding. They gave entrants from 2015 a half-price entry for this year so I decided to give it a go. Training went well. I haven't trained to 'race' a marathon since 2002 when I did the Ocala marathon in Florida, gunning for a BQ. Missed it by a couple minutes. These days I train to participate - without hurting myself - which is a fine goal in and of its own right. The training: 25-30 miles on average per week with a couple weeks closer to 35 miles. Long run progression: 12, 14, 16, 18.6. Tempo within long runs: zero. Interval workouts: 2-3 per month. ~100 miles per week riding so that counts as some additional aerobic development but you know all this stuff is pretty specific. I take myself soo seriously. Want to know my heart rate training zones? The goal: break 4 hours. Umstead marathon has about 2,400 feet of elevation gain and loss. The downhills hurt way more than uphills later in the race. There are also 5-6 miles of singletrack early on. I run in this park 2-3x a week and have covered all the terrain before, so nothing was a surprise. Miles 1-2: 7:45 minute pace to get a bit of space. ~40 people ahead of me. Miles 2-5: singletrack on the rocky section of Company Mill. Passed a couple people. ~9 minute pace. Mile 5: Greeted by the family cheering section! Mile 5-9: Singletrack on Sycamore trail. Passed 2-3 people. Miles 9-10: Old Reedy creek road down then up. 8-9 min pace. Felt good. Mile 10: Mind-altering potty break. Felt sooo much better, man. Lost five spots and two minutes. Miles 11-15: Turkey creek section of Umstead. Up down down up up down down up. Passed 5-6 runners. Mile 15: Turnaround and a visit with my family and friends. Yay! Mile 15-20: Turkey creek. Up down down up up down up down up up. Passed 5-6 runners. Miles 21-22: Old Reedy Creek road downhill then uphill. 8s to 9s. No one in sight. Mile 22-24: Out and back on Cedar Ridge. Painful downhill. Felt fine uphill. Passed 3 people. Miles 24-26: Back to the camp. Passed 1 person cramping with just a few minutes to go. low 8s was as fast as I could git'. Finished. 3:48.03 clock time. Watch time 3:44.40 (stopping for drinks, smelling flowers, slapping high fives). They gave out the top 15 awards for both 2015 and 2016 and I was the 12th 2015 male finisher, 20th 2016 finisher. 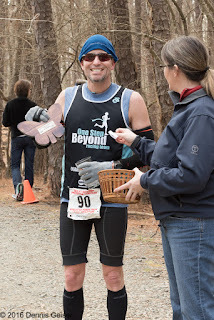 23rd overall (3 women ahead of me). Energy held up well, legs held up well, quads always hurt in the final miles. Maybe I'll do more drop and depth jumps and see if this helps for the Triple T and Ironman Chattanooga. How boring was this report on a 1-10 scale - with one being super duper awesome, and ten being I just scraped my eyeballs out with a spoon? Would more vivid imagery help, or should I fill in the gaps with runner dementia and deep seated neurosis? After the race I headed to Inside Out Sports for the Slowtwitch Road Show, and was able to catch a presentation by none other than 6x Hawaii champ Mark Allen. It was about his journey to beating Dave Scott in the 1989 Ironman. It was good! Next up is the Inside Out Sports Olympic distance at Beaverdam on April 30. I'll be biking lots between now and then. After that it is go time at the American Triple T in Ohio. That adds up to an Ironman over 3 days of racing. Shameless plug: Check out our 2016 clinics if you want to improve your swim technique and open water skills.